Korus is a gothic black metal project from Essex, United Kingdom. Sam Korvus performs and records all of the music(guitars, keyboards,and vocals).As a live band Greg Chivers (bass) Liam(rhythm guitar) Sam Curtis(drums)accompany him. 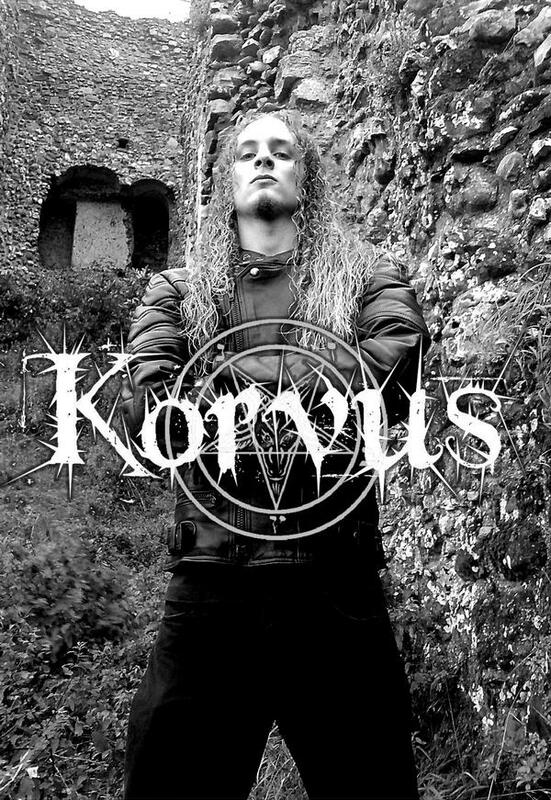 Korvus began in Autumn 2004, and recorded an extremely raw and satanic demo tape called 'Dark Desires' using a 4-track portastudio, which was distributed locally to build up a small fanbase. After a few months of writing and rehearsing they recorded a second demo CD in February 2005 called the 'The Kingdom Of The Raven', and spent the following few months playing in local venues. In summer 2005 they were discovered by SixSixSix Records, appearing in the November issue of Metal Hammer, and supporting 'Theatres des Vampires' and 'Draconian Order' on their UK tour in October and November, including their gig at The Underworld which is regularly shown on 'Redemption TV'. Since then they have played various gigs with bands such as Hecate Enthroned, Abgott and many more, and appeared in magazines such as 'Terrorizer' and 'Devolution Magazine.' Korvus has just released on their debut album 'In the Name of Lucifer'.